The Anishinaabeg (Ojibwe, Odawa, Potowatomi) have always revered the island of Michilimackinac, so much so that at the conclusion of the War of 1812, the Odawa tried to keep it in their possession. The Odawa suggested that the British negotiators offer the Americans a greater quantity of Anishinaabe land on the mainland as a price to keep Michilimackinac in the possession of the Anishinaabeg with trading access allowed to the British. We know that this did not happen but was it possible? Father – Last year you called your children around you and told them to defend this island; that it was the most important place on this side of Quebec, it was the key to the whole North and Western country and if we stood by you like faithful children you would not give it up to the enemy but defend it to the last. Now Father your children have been here and faithful, they stood by you and when the enemy had effected a landing your children beat them back to their vessels and saved this island. Father – We have learnt with sorrow that this great and important place is to be given up to the Big Knives but as we fought for it we are not willing to part with it. We therefore hope you will act by us as we have done with you. We & the principal chiefs and warriors of our nation desire you will send a suitable messenger to acquaint our Great Father the King that we the Ottawas of L’Herbe au Croch [sic] will give two leagues of [our] [own] land [orig emph] to the Big Knives in lieu of this island which Great Father has [capitu]lated to return to the Big Knives. The Odawa actually specified the quantity of land they offered in exchange, it was a tract by Gros Cap, six miles by six miles which they believed to be the “full equivalent for this island.” These council proceedings were forwarded to the Department of Indian Affairs. It is further agreed between the two contracting parties, that in case any of the islands mentioned in any of the preceding articles, which were in possession of one of the parties prior to the commencement of the present war between the two countries, should, by the decision of any of the boards of commissioners aforesaid, or of the sovereign or state so referred to, as in the four next preceding articles contained, fall within the dominions of the other party, all grants of land made previous to the commencement of the war, by the party having had such possession, shall be as valid as if such island or islands had, by such decision or decisions, been adjudged to be within the dominions of the party having had such possession. The possibility was there, but in the end the British meekly vacated Michilimackinac and set up a post northeast of Michilimackinac at Drummond Island. By 1829 the boundary line would finally be settled and Drummond Island too, became property of the United States. The fact that the British army set up a post on a disputed island in the nexus of Lakes Huron, Michigan and Superior area offers testimony that the Odawa’s wishes could have been addressed. The political will was not there, nor the negotiating skill or backbone. Three years after this initial meeting, in July 1818, the Western Confederacy again addressed these issues, asking the British to rectify their loss of Michilimackinac. Odawa Chief Okedaa (aka Ocaitau) had been selected as chief speaker (Ogimaa-giigdo). His mizhinawe (aide de camp) laid down four wampum belts, the 1764 Covenant Chain wampum belt, the 24 Nations belt (or promise of annual Presents), the 1786 Covenant Chain re-pledged, and the peace belt signifying the end of the War of 1812. Father something whispered in our ears that it would be good policy for us to sleep during the war, and cultivate our Lands for the support and comfort of our families, but my father, when one of your warriors told us it was for our good, and that you would never make peace with the Americans till you would drive them over the Mississippi and that then you would make a large road that would divide them from us, that they never should be allowed to step over it, and that when you would make peace, all your red Children that would join you should be consulted, and included as your sincerest friends. At the same time that you implored our assistance, you won the influence of our sensible Chiefs, who talked to us incessantly, till with one voice we raised the hatchet and made the Americans run out of their Fort [Michilimackinac]. Here Okedaa specifically mentioned the promises made to the Western Confederacy that the boundary lines would be re-established as per Britain’s proposed “Indian Country” which was to run along the Ohio River to a point and then west to the Mississippi. The Anishinaabeg of the Western Confederacy, just like the Shawnee under Tecumseh, were fighting the Americans to reclaim land that the British gave to the Americans after the Revolution. Okedaa continued and mentioned the Anishinaabeg’s trepidation to enter into war with the Americans again, especially after the British had abandoned them at the Battle of Fallen Timbers in 1795. Father – We were not anxious to raise the hatchet for fear the Americans should be too strong for you, and in that case we should lose your support, and be obliged to fight them ourselves in defence of our women and children, and prevent their taking from us the Lands, that the Great Master of Life planted us on, but knowing your words to be the breath of truth, we seized the Hatchet painted our faces and made the woods echo with the war song. Father – Tho’ many of our young men were mixed with the earth we were happy, and took to your Chiefs, the hair of a great many of the heads of your enemies; and tho’ we were enjoying ourselves and every thing going on well, we were astonished one morning to hear by a little bird that you had buried the Hatchet and taken our enemies by the hand. Father – We of course supposed the enemy had been crying over your head to be charitable to them, to make Peace to save themselves. We were glad to hear this news not doubting that all you told was coming to pass. Father – My heart now fails me. I can hardly speak – We are slaves and are treated worse than dogs. These bad spirits take possession of our lands without consulting us, they deprive us of our English Father and traders – they even tie up and torture us almost to death. Father – Our chiefs did not consent to have their lands given up to the Americans, but you did it, my Father, without ever consulting us and in doing that you delivered us up to their mercy. They are enraged at us for having joined you in the play and they treat us worse than dogs. Father – We implore you to open your ears, to listen to our Grievances, fulfill your promises [emphasis added], that we may be released from slavery, and enjoy the happiness we did previous to the War. Odawa Chief Okedaa, with the wampum belts displayed in front of him, physical manifestations of the treaties between the British and the Western Confederacy, pleaded once again to the representatives of the Crown to fulfill their promises so that they could enjoy all that the creator had given them. Although the chiefs of the Western Confederacy had suggested a plausible scenario for the British negotiators, in the ensuing years it took to settle the boundary issues, the British did not exert themselves in advocating on behalf of the Western Confederacy. It is totally conceivable that at least a portion of upper Michigan or Wisconsin could have been set aside as an “Indian country” as the British had promised. The mechanisms were in place but not the honour. This is why the Anishinaabeg say that we did not lose the war but we lost the peace. 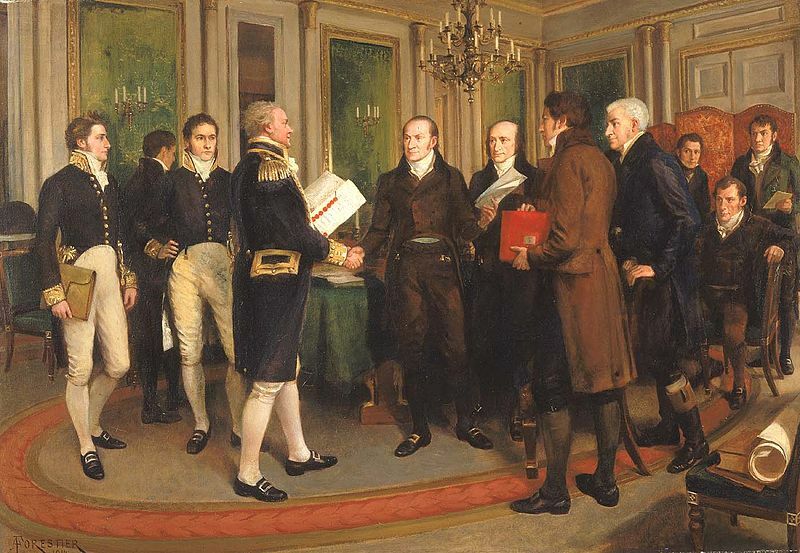 This post is the sixth and final in a series of essays on Anishinaabeg participation in the War of 1812. They were previously published at ActiveHistory.ca and, in a modified version, in the Ojibway Cultural Foundation newsletter. You will be able to find the rest of the essays here. Alan Corbiere is Anishinaabemowin Revival Program Coordinator at Lakeview School, M’Chigeeng First Nation. He can be contacted at alcorbiere@gmail.com. President’s Office 12th March 1815, LAC RG 10, Vol. 30, p: 17771. AO, F450, (Capt) Thomas Gummarsall Anderson Papers, 1814 – 1822, MS 23. The Ottawa [Odawa], Chippawas [Ojibwe], and Winabagoes [Winnebago], Indians assembled at Drummonds Island 7th July 1818, LAC RG 10 Vol. 32, pp: 19172 – 19177. Featured Image: Amédée Forestier, The Signing of the Treaty of Ghent, Christmas Eve, 1814, 1914, Wikimedia Commons, Public Domain.